Operation Christmas Child - Part 2! Priscilla Jane and Adele are the first girls to arrive. 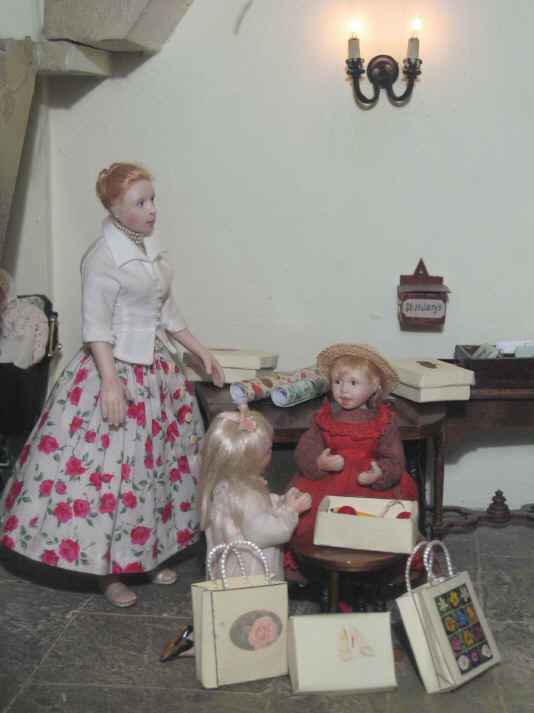 They have brought their shoe boxes in these really pretty carrier bags as you can see. Adele is really struggling here because she has brought TWO bags to church. One has her shoe box and the other has a big roll of Christmas paper to wrap the boxes up. 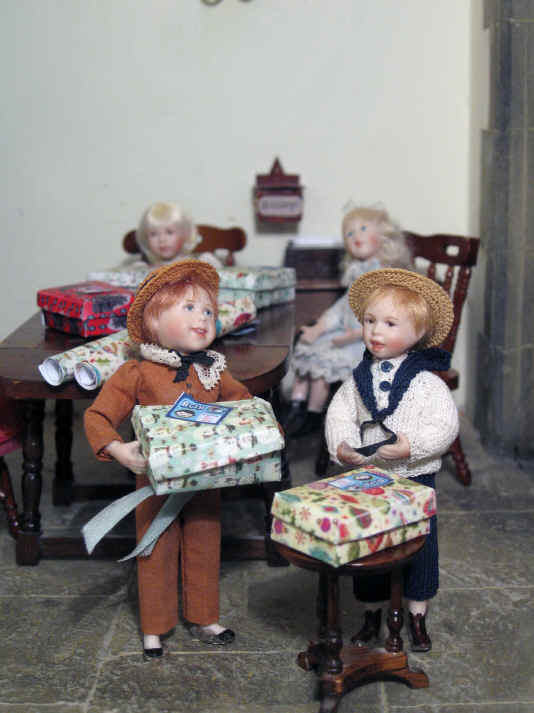 Tom and Ben have already arrived and they have decided to desert their shoe boxes and leave them on the table here. Adele has insisted on seeing what is in the shoe box that Priscilla Jane chose. She has not forgotten how much she fell in love with this box and so wanted it for herself just because she loved the picture of the pretty pink shoes on the lid. Miss Esther is keeping a beady eye on the pair of them knowing that they had a little argument about this box and who should have it. She does not want another argument and fall out between these girls. Oh dear! 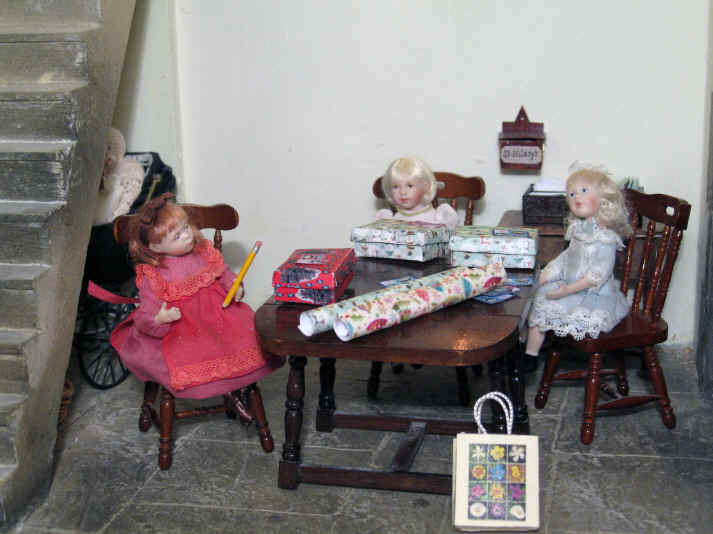 Adele has spotted that Priscilla Jane has bought a skipping rope for her shoe box. As you can see she simply cannot resist having a play with it! Tom has decided to show off the aeroplane he has bought to go in his shoe box to Ben. He is pretending to fly it around church......naughty Tom! 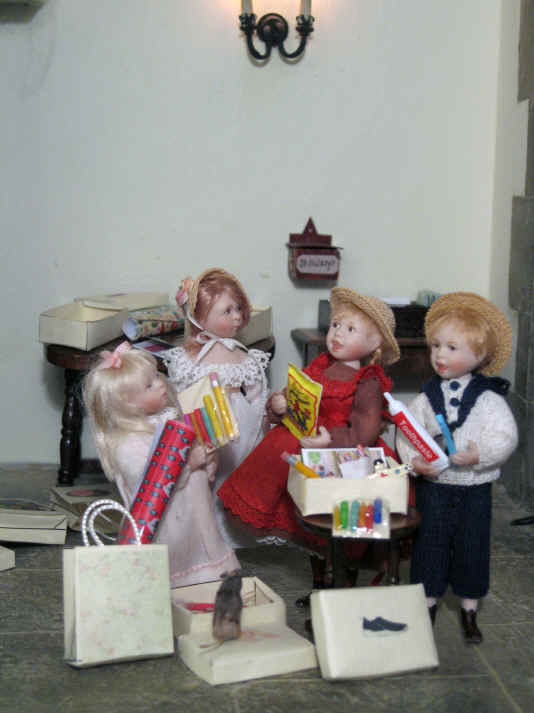 Belle and Bardsley are very interested in the toy plane and stay around to see if Tom lets them play with it too. Esme and Ernest the local pair of ducks are rather less than impressed.......because they know that they can REALLY fly unlike this toy plane! 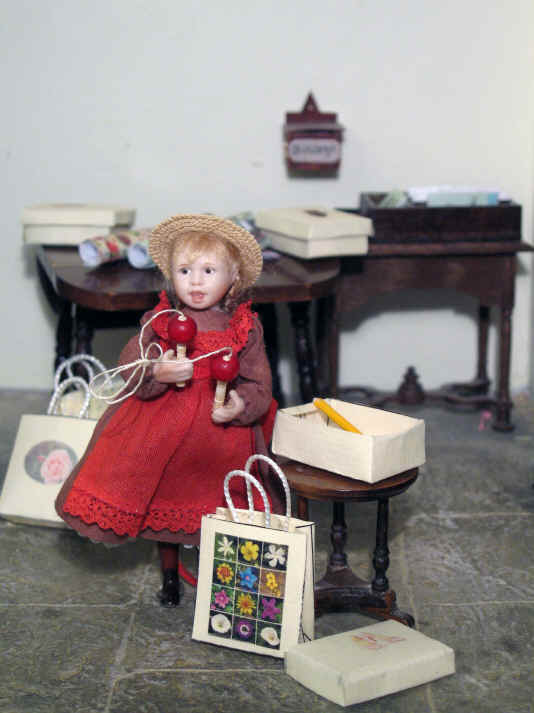 Adele was so excited as she became carried away skipping with the skipping rope that she has knocked Priscilla Jane's shoe box on the floor and scattered ALL of the gifts on the floor. Prisiclla Jane will NOT be happy will she when she sees what Adele has done? 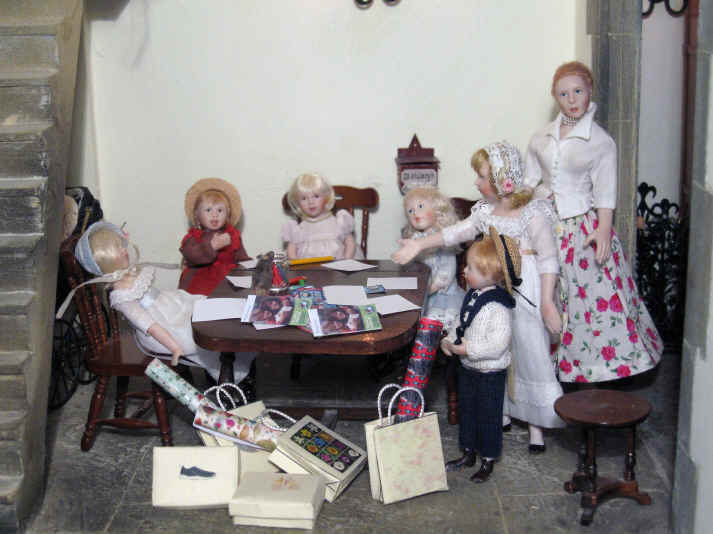 The children have decided to help Adele out and pick up the gifts that have fallen on the floor. Tom is showing off HIS gifts now. He has bought a toothbrush and toothpaste because one gift has to be a hygiene item. Adele is checking out the packet of jelly babies. Sweets count as a gift that has to be something the receiving child can eat or wear. Priscilla Jane is holding some crayons. Crayons are allowed as they are accepted as the educational gift. Tom has bought a jigsaw for his shoe box. He thinks that this will be fine as it counts as the gift that is "something to love". Sepp has decided to perch on the pretty lid with the pink shoes on and check out Priscilla Jane's box to see what gifts are in it! We hope that Sepp doesn't decide to have a nibble at any of them! Phoebe has now arrived and has decided to show Miss Esther the gifts she has chosen for her shoe box. Phoebe LOVES jewellery and always likes to wear a pretty neckless. So Miss Esther is not at all surprised to see that she has bought a pretty piece of jewellery. Miss Esther is very happy with this as it is allowed. 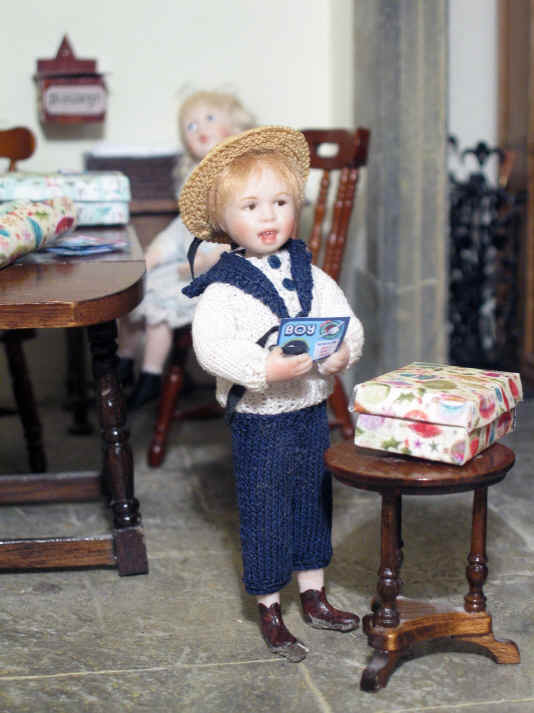 Phoebe has also bought a little doll. 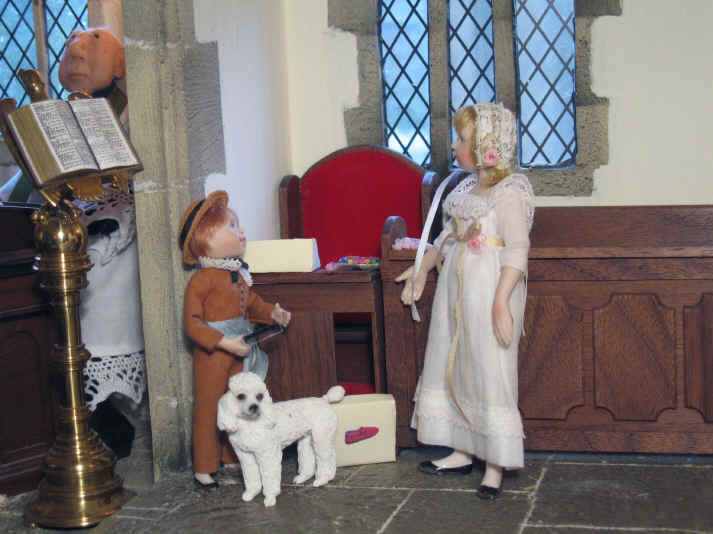 Phoebe loves to have HER doll keep her company when she is at church so she thought that EVERY girl would also love to have a doll too! Phoebe has chosen a hair brush as her hygiene item because it will enable the child who receives her box to keep her hair tidy. Alice is here checking Ben's shoe box now. He is showing off the comb he has bought for the boy who will receive his box. He has also bought some sweets and a stick of rock for his box. Have you noticed how Belle is just happy to stay by Ben's side today? Miss Esther has told the children that it would be really nice if they could write a little letter to the child who will receive their shoe box. "The Samaritan's Purse" organisation which organises this project, encourages the children to write letters to the children who receive the boxes. Sometimes the children who will receive these boxes may even decide to write back! 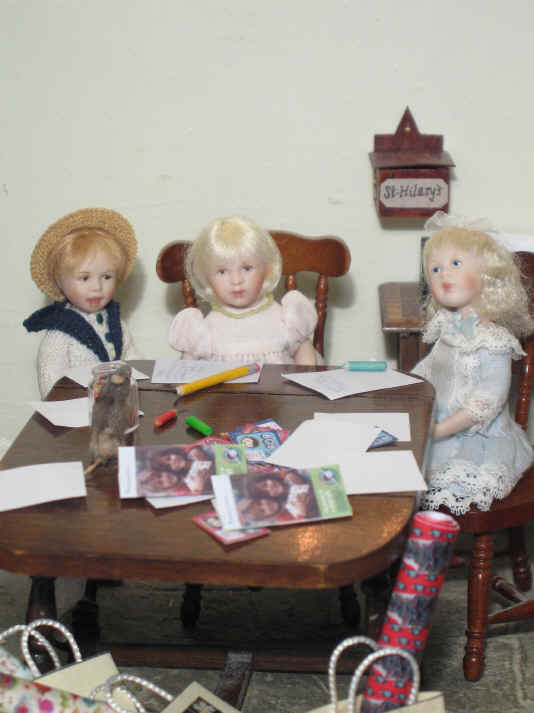 Alice is giving the letter paper out to the children. Oh dear..............those pretty bags with the Christmas paper in keep falling over - and who has left those shoe boxes on the floor? Phoebe and Emily are the first to finish their letters. Sepp looks as if SHE would like to write a letter too doesn't she? Phoebe has written a really nice letter and it says. "I chose the hair brush all on my own and I hope you like it. love from Phoebe". Well done Phoebe! You have even spelt all the words correctly too! Emily, on the other hand couldn't think of much to write at all and wrote "My name is Emily I hope yoo like yor shoo bocs"
Miss Esther is very happy with the letters all the children wrote even if they could not spelt every word correctly. She told the children it is the thought that they had put into their letters that counted! ....and it is our Amelia! Amelia is showing the children how to wrap their shoe box. Tom has decided to come around and take a closer look so that he makes sure he watches her every move closely. Amelia has now wrapped her box whilst taking care to wrap the lid and box separately because the Samaritans' Purse people have to be able to open the boxes and check what people have put in them. If they find something they are not happy with they can then easily take it out and put something else in its place which is more suitable. 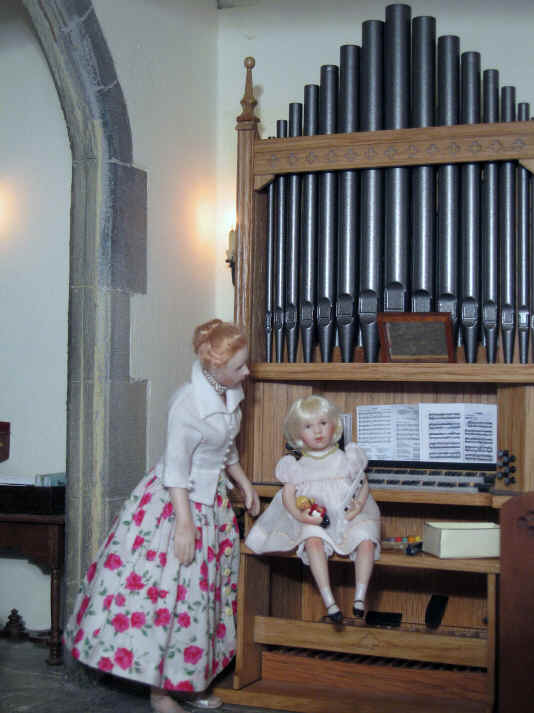 Amelia has chosen a girl between the age of 5 - 9 as the vicar suggested and is just going to tick that box on the label she has stuck on the top of the lid. Emily has chosen to be a bit different here! Can you see that she has stuck a blue label for a boy on HER box. Emily loves to be a tomboy when away from church and thinks she knows what boys would like! Tom has now watched all the girls wrap their boxes and thinks he now knows how to do it properly. 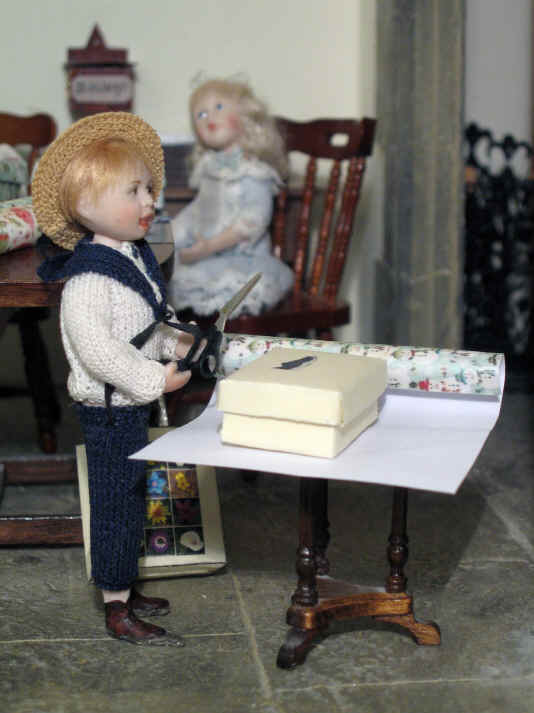 He has now borrowed the scissors and is just about to cut the Christmas paper in order to wrap his box. Well done Tom. He has done a splendid job of wrapping his box. He only has to stick his label on the box and it is finished and ready to go! Ben has also now wrapped his box too and is showing it off to Tom. Can you see what is wrong with Ben's box? He did not watch Amelia when she was wrapping her box because he thought he knew how to do it already. But he has not done so well has he and the label is all wonky too! The children have really enjoyed taking part in the Operation Christmas Child project this year. 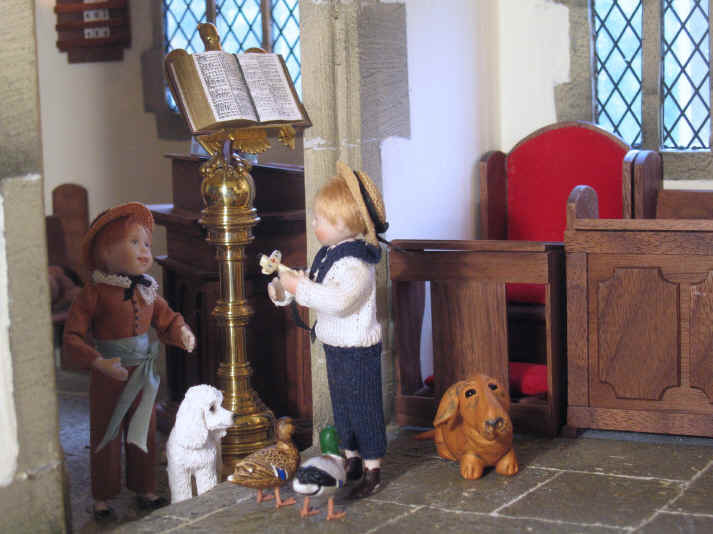 Already they are begging the vicar to take part next year too! 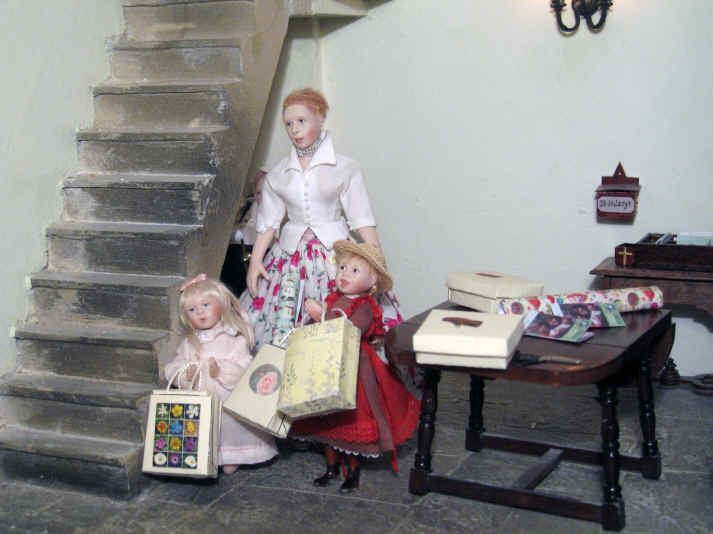 Many thanks to Jim's Dollshouse Pages for the shoe box and bag template. Thanks to the Wee Property Company for our plane and doll!